With so much to see and do, it can be hard to see and do it all in just one short trip to Prescott. To assist you in your weeding-out process, a completely unscientific list of the Best of Prescott's Outdoors is provided for you below. If you get a chance to do just half of these things, you can feel confident returning home that you've experienced a large portion of what Prescott has to offer. Now, remember: this is entirely subjective. It is not necessarily based on the amount of annual visitors, available amenities or the exceptional value provided to visitors. It is – however –a guarantee you'll see plenty of locals frequenting these locations. The Best Lake Award was difficult, because most of the lakes in the area share a lot of the same characteristics. They're all within a short cruise of downtown Prescott. They're typically all manmade. The majority of them are stocked with fish. But there is just something that sets Lynx apart from the rest. Perhaps it is due to its surplus of trails in the area, or the fact that it is also the winner of the “Best Domestic Campground” award. Perhaps it is the Lynx Lake Store, which also features a café. Regardless, you won't be disappointed if you're forced to pick only one lake on your next visit and Lynx Lake ends up being it. Thumb Butte offers both semi-steep climbs and gentle grades, wildlife and nature, brilliant views and a well-cared for trailhead with benches, grills and bathrooms facilities. It is neither too easy, nor too difficult and appeals to all sorts of visitors, including hikers, joggers and mountain bikers. This award goes to the Peavine Trail, a four-mile trail originally built by the Santa Fe Railway back in the 1890s. 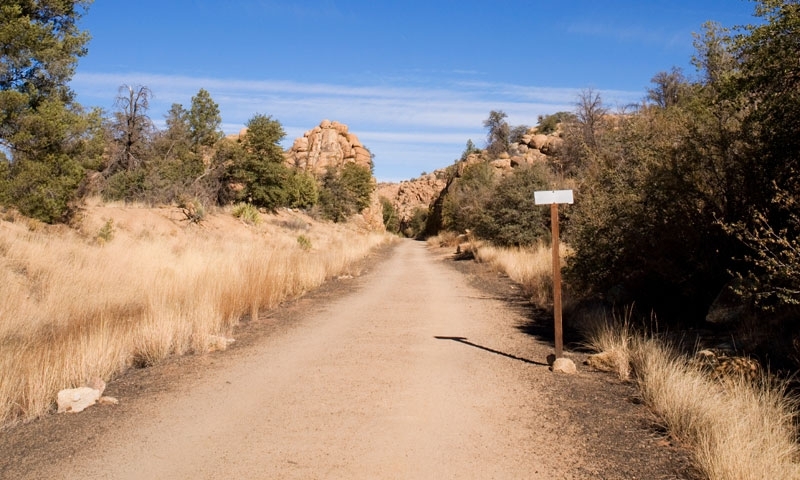 Take in the views of the Granite Dells and Watson Lake as you bike along the trail. The trail is well maintained and in great shape, which takes several variables out of the mix and allows you to just enjoy the ride. Most of the lakes in Prescott do not permit swimming, so the Best Swimming Hole award recipient is a little off the beaten path: Fossil Creek, near Strawberry, Arizona, is where it's at! Travel through miles and miles of high-desert and brush on a dirt road, then trail, until you suddenly come upon an outdoor water park of sorts in the middle of the desert. Lynx Lake comes in first here, too. This is because the lake is regularly stocked and fish can be caught from both the shore and while boating. Largemouth bass, crappie and rainbow trout are all potentially on tonight's menu. Watson Lake takes home this prestigious award because of its sheer size. 380 surface acres of calm blue water, obtrusive vegetation and granite rock formations make the entire exploration process fascinating. Rent a canoe or a kayak and see what you can see! The Best Golf Award goes to StoneRidge Golf Course. While this might not be the most prestigious of courses, it is open to the public. It also has a great clubhouse, reasonable prices and great views of the surrounding valleys. The award for Best Domestic Campground goes to Lynx Lake, which offers all sorts of amenities including flushing toilets, drinking water, paved roads, general store and grills. It is also impeccably maintained, offers exceptional views, and is within five minutes of restaurants, shopping and gas stations.